As an up and coming junior executive, as you know, perception is paramount. Office Paraphernalia can promote that status and largess among senior managers. Leverage your potential with Classic Management Paraphernalia. Whether your Business Specialty is in, Travel Careers, E-Commerce & Internet,, Finance & Accounting, Franchising Human Resources, Legal Management Marketing & Advertising, Perception Management Operations, Personal Finance Sales, Technology or Women in Business our Classic Management Awards are right for you. We want to give you the Business, just reach out we have what you want. Hiring & Firing, Intellectual Property, Internet & Technology, Legal Mergers & Acquisitions, Money & Fundraising. Real Estate/Landlord-Tenant, Sales & Marketing, Starting a Business Business Guides Forms and Seminars. We are sensitive to New Age Personal Growth Management and the awards needed to breach the horizon. Construction, Medical Practices, Restaurants, Retail Trade, Manufacturing Services, and the Wholesale Trade. Further, Managers in, Human Resources, Accounting, Advertising & Marketing, Computers & Software, Financial Services Internet & Online Management, and Small Business upstarts all benefit from our service. For further informatin consult our Learning Center Business, Answers for Buyer's Guide and Franchise Directory. Consult Scari.Org Glossary with our Partner Resources Podcast Library and Quote Center. Classic Management in conjunction with Scari.Org has been a proud contributor to the business world since 1985. We want to give you the business. 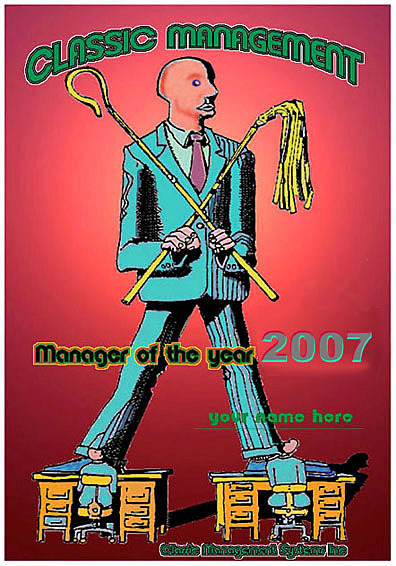 One can collect all twenty three Classic Management Awards going back to 1980. Your walls can be lined with management accolades adding further authority to your presence, confirming you abilities and impressing your associates..